Difference between revisions of "MaxNCMill"
[[User:Azureviolin | Hao]] just made MaxNC work with a dell latitude laptop (thanks Carlos for the donation of this laptop) on LinuxCNC 2.5, Ubuntu 10.04 Lucid, so he is planning to upgrade the desktop pc which was hosting the MaxNC machine before. [ 54.798391] RTAI[hal]: ERROR, LOCAL APIC CONFIGURED BUT NOT AVAILABLE/ENABLED. afterwards run "sudo update-grub" and restart. For configurations that have not customized emc.nml, remove the inifile line NML_FILE = emc.nml. This will cause the most up to date version of emc.nml to be used. For configurations that have customized emc.nml, a change similar to this one is required. Failure to do this can cause an error like "libnml/buffer/physmem.cc 143: PHYSMEM_HANDLE: Can't write 10748 bytes at offset 60 from buffer of size 10208." Hereby known as "That Goddamned Mill (TGDM-"POS" for short)"
MaxNC now has a new homepage: http://www.ximotion.com/ As of 10/29/2011, the page for the 10 CL-B is http://032568b.netsolhost.com/page13.html. -Britt. Improperly used, the mill can destroy itself, its tools, and parts of you. Please know what you are doing and don't be afraid to ask questions. Always check limits by manually running outside your mill area with the tool at a safe Z height. DO NOT UPGRADE THE UBUNTU 8.04 OR THE KERNEL ON THE HOST MACHINE! USE VACUUM TO PREVENT DUST EVERYWHERE WHILE MAXNC IS MILLING! ESPECIALLY AVOID DUST GOING INTO PC! Though we have implemented basic safety shutoffs, we should be watching it all the time. It will very happily mill through itself without stopping. If it appears to be getting out of hand, the F1 key should toggle Emergency Stop in the software. This will power down the spindle and stop it where it is immediately. If it REALLY IS getting out of hand, turn the power switch off (the one on the side of the control box). Note however that after doing this you'll probably need to restart the software because it will be out of sync with the controller (it gets out of sync). We have installed EMC2 and AXIS and some other software on the driver PC. This depends on a custom kernel and Ubuntu 8.04 -- PLEASE DON'T UPGRADE! The resulting binary should run and give you a UI on your system. There's actually nothing machine-specific that you need at this point: your UI will look pretty much exactly what we have now. Select the "axis.ini" config file. For most of the configurations there is a smaller window w/ an inverted cone representing the spindle (this is the default view). This will show the progress of your milling run. You can change the view and pan/zoom/tilt with the mouse. Then try gcode from the toolchain of your choice. The EMC2/Axis application will import most image formats and create a raster scan tool path with milling depth proportional to image intensity. Haven't tried this but it looks very cool! DXF is a standard file format used by many CAD programs (as well as exportable from inkscape and Adobe Illustrator). It's a good choice, especially as gcode export from Inkscape seems to be buggy. QCAD is an open-source 2d CAD program. Linux users can apt-get qcad, there is open-source executable for Windows as well (but it's hard to find as Ribbonsoft took it closed-source (wtf?) and most searches end up at their page.) QCAD is very solid and a great place to start with CAD, especially if you can't afford/don't need Autodesk/Solidworks. The scale feature in QCAD is counterintuitive at first. To scale your object, select all, then select Modify -> Scale. Click the right arrow on the bottom of the toolbar on the left side. It will then ask for a reference point, click on the lower left corner of your image. It will then ask for the scale factor and will scale your object. We use a DXF-GCode conversion called, unsurprisingly, dxf2gcode http://www.christian-kohloeffel.homepage.t-online.de/dxf2gocde.html [URL is not a typo]. In the /home/nb/dxf2gcode directory, run the dxf2gcode_v01.py command. Open your dxf file from File->Read DXF. It sometimes barfs on DXF exported from Inkscape (works fine for me), but is fine with QCAD, so a workaround is to load the Inkscape dxf in QCAD and save it from QCAD (it's also easy to scale and rotate if necessary). Coordinate units are kind of a crapshoot and don't make much sense right now. Note that it may be doing a lot of math without benefit of the numpy library so it can be SLOW. It has no progress indication, and doesn't redraw the screen, so it may look like it crashed. Sometimes it actually does. But be patient! Sometimes it gives the error "Failure reading like stopped at line X. Please check/correct line in dxf file." If X is the number of lines in your DXF, don't worry, it read the whole thing. By default it lifts the tool up unnecessarily high, you can improve cutting speed by setting the Z retraction area and Z safety margin to a lower number than the default of 15. Cadsoft EagleCAD is a schematic editor and PCB layout tool. It's not open source, but there's a free version that is very decent and limited only to the size of board you can lay out. To generate GCode from your Eagle layout, get the scripts from http://www.pcbgcode.org/. These do "Isolation routing," that is, they will generate GCode to mill away copper outside the traces you laid out on a copper-covered PCB (as well as drill it). I've added MAXCNC mill-specific commands to the pcbgcode config stuff, including setting the spindle speed to maximum and turning on the motor. (Config file is /home/nb/eagle-5.6.0/ulp/gcode-defaults.h on the mill PC). To start, create a layout in Eaglecad. To work best, use one layer (which can make routing a pain), and use a minimum trace size of 0.012 inches. Make sure you do a DRC check with 10 mil isolation spacing (thouugh I have found it misses trace-pad distances). This creates several gcode .ngc file in the same directory as your eagle .brd file. They have suffixes like "top" "bot" and "d" for top copper, bottom copper, and drill. Run AXIS2 and load the appropriate file. Look CAREFULLY at the tool path. Does it really isolate everything you want it to? If not, you may have to increase spacing and re-run. Check especially places of small pitch and tight clearances, especially between traces and pads. Milling the copper is a tradeoff between quality and speed. At fast speeds, the copper tends to get rough at the milled edges. Slow speed rates help a lot but can lead to impractically long milling times. 2.5 ips gives beautiful results, but a good compromise is something like 5 - 8 ips (set in the pcb-gecode setup). If you look at File->properties in the EMC2-Axis tool it will give you a rough idea of the milling time. Raise the head so you can put the tool in the collet. Put it in as far as you can. Tighten gently, only enough to keep from falling out. Drop the head to about 1/4 an inch above the workpiece. Don't touch! finger-tighten the collet -- tightly! Home the Z axis VERY IMPORTANT DON'T FORGET!! I think the default Z Down dimension of -0.01 may be too much given that 1-oz copper is supposed to be only 1.4 mils thick (0.0014 inches). I've had good results with -0.008; .0.005 led to problems because I think the PCB I used was not perfectly flat at at some places this depth did not hit "bottom." With further experiments this may be because the clamps are compressing the PCB: at least it seemed to work fine more than 1/2 inch away from them. For through-hole components, you'll need to drill vias. Doing this is a multi-step, involved process. Because etching is sensitive to the trueness/truing of your board's surface, you only want to etch the board when it's mated directly to a metal block, but you need a plastic sacrificial stop for drilling. So, etch as normal, then add two registration marks to the top of the board. Unmount it, add the plastic backing, change tools, remount, and rezero, respecting the registration. From there, you can run the drill program after suitable modification (you need to manually comment out all M06/tool change commands). Ensure "Do tool change with zero step" is UNCHECKED. If this is checked, EMC hangs. No, really, you don't want to deal with this problem. It's awful close to "EMC hangs, you have to hard kill it, and then rezero the whole setup." Once you've got the GCode files for etching and drilling generated, you need to tweak the drill file. As it's currently configured, our milling rig doesn't handle tool changes well (the CNC doesn't support automatic tool change, but the EMC software thinks it does, so the whole setup gets Very Unhappy when it runs into these commands). To remove these, open your drill ngc/tap file in a Text Editor Of Your Choice, and comment out all lines containing the tool change command M06. In GCode, comments are parenthesized lines, and they cannot be nested. Open your drill file in EMC and make sure it looks sane. There will be a bunch of tool change steps, where it runs itself back to (0,0,0.2), then goes back to work. This is the tool change position specified above; you may want adjust the point to be closer to the centroid of your drill pads, to shave off a minute or two. After your etch file looks good, and your drill files look reasonably good, go ahead and set up for etching as above. When etching is completed, don't take the board out! We need to add registration marks for the remounting. Manually walk the head down to (0,0,0.5). Once you're there, turn on the spindle, and gently lower the head til it just bites the copper. Personally, I went to (0,0,-0.008), which is the depth used for etching. Leave the spindle on, and raise the head back to (0,0,0.5). You can turn the spindle off if you'd like, then slew over to (1,1,0.5). Once there, turn the spindle back on, and go down to (1,1,-0.008) to make the second registration mark. Raise the head out of the board, then turn off the spindle. I'd also recommend slewing back to (0,0) at this point, to make re-registration easier. Next, load up the drill file in EMC. You should still have the outline of the paths the head just etched on the display, with the drill file overlaid. This is a good chance to sanity check the line-up of things, etc. Once that looks right, move to adding a plastic backstop and re-rigging the board. With those two registration marks in place, you can re-rig the board with a sacrificial plastic backstop underneath of it. There's a few of these in the document trays next to the mill. Change out to your PCB drill-end, re-zero as for etching, and ensure you have good registration (make sure the drill-end is sitting on the 0,0 mark when you insert it, raise to (0,0,0.1), and slew to (1,1,0.01) to eyeball the match up. If you want to be totally certain, you can turn the spindle on and just bite the board, but, in doing so, you're likely to obliterate your registration mark, so I'd advise against that. Make sure you're happy with everything, and, assuming you are, hit Run. Keep an eye on things and be ready to hit the kill switch (if babysitting feels tedious, just imagine yourself doing all these holes on the drill press, and then try not to hug your newfound robot slave/friend). -- User:Jbm 2010-05-07 13:20; a big thank-you to User:jtfoote for all his help in familiarizing me with the setup. Latest: the gcode export from Inkscape is buggy. It's python so could possibly fix, but it looks kind of involved. Workaround: File->Save As-> .dxf, then use the QCAD->DXF toolchain. IMPORTANT: Read the "Help" tab when you Effect->Export->Export as Gcode This tells you how to set the origin, and how to name your layers for different tools. Cutting fiberglass (PCB) will eventually destroy any kind of steel cutting tool. The glass in the resin matrix is much harder than steel. You need carbide tooling. Note that carbide is too brittle for most metals and will just snap. * smallparts.com  carries Niagara carbide end mills in fine pitches suitable for circuit boards. Available via Amazon as well. * Spring loaded tool holders account for warped PCBs and mills:  2linc <-- expensive. Cheap ones exist. User:seph was hacking on one. Some notes from him are at http://www.directionless.org/tmp/maxnc/ There's a pinout, and an emc2 config. He also recommends thinking about eventually upgrading a lot of the components. Seph's work is what I (mikew) based the current functional HAL and INI files on. The bed is the blue anodized aluminum extrusion to which the workpiece is affixed. The collet is mounted at the end of the motor. It holds the milling bit. Note: do not lose the collet, as it is basically impossible to obtain a replacement. The milling bit, which superficially resembles a drill bit, is used to machine the workpiece. To setup the machine, bits are inserted into the collet and then tightened with two wrenches. The workpiece is whatever you're milling - copper-clad board for PCBs, aluminum, acrylic, etc. Workpiece holders are small threaded rods with metal "clips" that are designed to hold the workpiece firmly to the bed. They should not be over-tightened, as it can cause workpiece distortion. Backing material is a piece of scrap material used between the bed and workpiece. It's important to use backing material to protect the bed. Limit switches are located at the end of each axis. These act as safeties in case the milling machine reaches the end of its travel. Note: if you're milling and manage to trip a limit switch, the mill shuts off, in which case you'll need to redo your work. Be diligent. The X axis runs side to side; e.g. the "width" of the bed. The Y axis runs forward and back; e.g. the "depth" of the bed. The Z axis runs up and down; e.g. the space between the bed and collet. Use a piece of aluminum stock between the PCB and the bed. Use adjustable wrenches to cinch down the workpiece holders to the PCB. You only want the bolts to be finger-tight; the fiberglass substrate can actually be compressed if too much pressure is used, causing distortions in the milled part. Do not use pliers. The collet faces upwards (like the tip of a rocket) into the spindle. Keep the plastic guard attached to the milling bit. Place the bit into the collet, and bolt the collet into the spindle. Note: In the MaxNC control program, it's important to zero the mill - to set it to 0,0,0 - before routing a board. 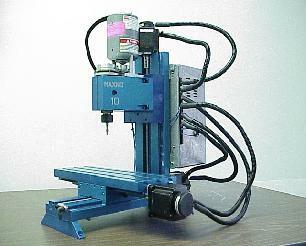 Occasionally, the milling machine will not home to 0,0,0 in the MaxNC control program. To fix this, go to Machine > Zero Coordinate System > P1 G54. In AXIS' Manual Control tab, adjust the X, Y, and Z axis feed controls until the tool is at the upper right corner of the circuit board. It is critical to zero the Z axis correctly. The idea is to drop the bit down onto the surface of the copper, with zero force, and then zero the axis. Use the manual controls to drop the bit, step by step, until it is about 1/4" above the surface of the PCB. Loosen the collet so that the bit drops onto the board. Tighten the collet. Immediately zero the Z axis. Controls for starting / stepping / stopping milling operations are located in AXIS' top toolbar. At this point, all of the axes should be zeroed. Click the Go button in the toolbar to start milling. Hao just made MaxNC work with a dell latitude laptop (thanks Carlos for the donation of this laptop) on LinuxCNC 2.5, Ubuntu 10.04 Lucid, so he is planning to upgrade the desktop pc which was hosting the MaxNC machine before. .... [ 0.000000] Local APIC disabled by BIOS -- you can enable it with "lapic" .... [ 54.798391] RTAI[hal]: ERROR, LOCAL APIC CONFIGURED BUT NOT AVAILABLE/ENABLED. 1.1. emc.nml changes For configurations that have not customized emc.nml, remove the inifile line NML_FILE = emc.nml. This will cause the most up to date version of emc.nml to be used. add large dowel pins for indexing PCBs with pre drilled holes. Face mill both to get flat surface.